Trader Joe's, you did me good!!! This stuff is pure addictive HEAVEN. Sun-dried tomatoes, garlic, basil, parmesan cheese, olive oil, walnuts (although I'm surprised pine nuts aren't used here, as in traditional pesto)...easily spreadable, good cold or warm, and the smell is absolutely tantalizing! Tangy, herbal, savory, sweet, pungent...imagine all of these flavors times 100. This stuff is so concentrated, both in flavor and texture, that you only really need about a tablespoon per serving...although you may easily go overboard. 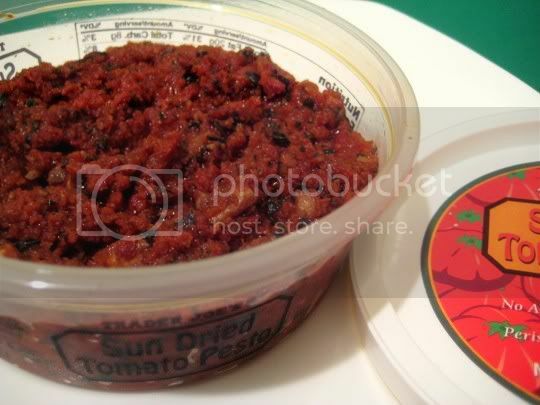 I think it's really the sun-dried tomatoes (that rich, sweet, tangy, almost fruity taste) that stands as the overbearing flavor champion, but trust me, it's in a GREAT way. Garlic is a close runner up. Try in place of pizza sauce, on crackers and pitas, topped with mozzarella, maybe even added to a marinara sauce for a lot of extra kick. Buy again? No question, this has become quite the regular among snack foods in my fridge. This amazingly wonderful, yes, addictive product has just been discontinued!!!!! I know! I can't believe it! They keep taking the best things away! I just tried this for the first time in a demo they had using it on their frozen naan bread...now it's gone! Bummed out!